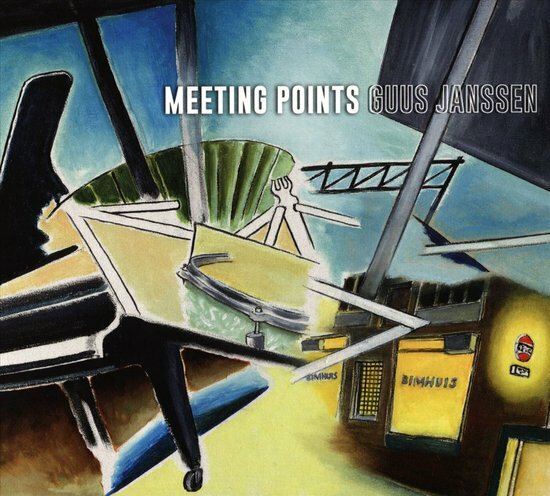 This retrospective of Dutch pianist Guus Janssen, featuring his work as a brilliant improviser, composer for improvisers, and leader of excellent ensembles, will make you wonder why you have not heard more of him. The nine, previously unreleased live pieces selected for Meeting Points were recorded between 1989 and 2014. All emphasize Janssen smart and witty compositional and improvising skills, as a musician who likes to twist alongside the listener expectations as well his fellow musicians, a versatile pianist who is equally versed in the work of jazz pianists Lennie Tristano and Art Tatum and classical composer Franz Josef Haydn. It is no surprise that Janssen was the natural choice to take the seat of pianist Misha Mengelberg in the Instant Composers Orchestra (ICP). Janssen acknowledges Mengelberg's seminal influence in his cover of “Peer Counting Song”, a duet with drummer John Engels, recorded in 2014. This gentle-contemplative piece sound now as a moving homage to the great pianist who retired from performing due to dementia. The insightful liner notes of Dutch jazz scholar Kevin Whitehead shed light on the eclectic pieces, all were recorded at Amsterdam’s acclaimed Bimhuis club, close to Janssen’s home. The earliest one, “Rondo” from 1989, is a post-modernist, surreal piece, performed by the short-lived Cluesome Quartet, with clarinet player Michael Moore, cellist Ernst Reijseger and drummer Han Bennink (soon to be incarnated as the better-known Cluesome 3, without Janssen). This kaleidoscopic, epileptic piece mocks the sound of ancient Chinese instruments, swings hard, quotes briefly Charles Ives composition and is often intruded by musique mecanique sounds. The brilliant 1999 title-piece duet with alto sax player Lee Konitz, another disciple of Tristano, shows these two quick-eared masters at their best, inventive, surprising with their sudden switchbacks and dropouts. Both are enjoying this clever, game-like improvisation. Another duet, “April” from 2007 with the hard-swinging Bennink suggests this long-running duo open and imaginative interplay. Bennink powerful swing enables Janssen to abstract on Tristano ideas. Three pieces from 2011 feature the trio of Janssen with double bass player Ernst Glerum (who is also a member of ICP) and Janssen brother, drummer Wim Janssen, augmented by clarinet player Michael Moore (another member of ICP) and violinist Sanne van Hek. The playful performance of “Koto à Gogo” revolves around loose hip-hop pulse set by Wim Janssen; “Vrij naar AT” is a wise, spare salute to the hyperactive music of Art Tatum and on “Janus Bifrons” the quintet disturbs the melodic-swinging theme with typical ICP eccentric twists. Two recent compositions from 2012 are by an impressive sextet with van Hek, Glerum, Wim Janssen, trombonist Wolter Wierbos (who also plays in ICP) and guitarist Raphael Vanoli. Both “Pogo 1” and “Pogo 2” are an amusing, speedy pieces, full of ironic, quirky game-like twists, twisting even the artificial distinction between instant composing and improvisation. Janssen is a one of a kind, don’t miss this fascinating retrospective.